Culverts, Sluices and bridges often act as choke points in rivers, streams and ditches. Culverts by their very design usually incorporate guards to restrict access but this will naturally act as a barrier for debris carried downstream with the waterflow. 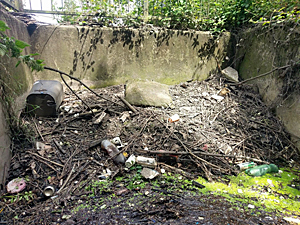 As debris and litter build up in front of these structures the risk of flooding is massively increased leading to damage of structures, property and potentially a risk to life. As many culverts and bridges tend to be related to roads, railways and other infrastructure the potential flooding risk is very often detrimental as these areas will be used frequently by the public. It is therefore essential to maintain culverts and guards to prevent them being blocked to the point, where the water level backs up and floods. We regularly respond to calls requiring urgent culvert clearance when heavy rain is expected. This will typically be at a known pinch point that regularly floods and therefore is cleared prior to heavy rain to try and reduce the risk of flooding. Other clients have us attend their culverts several times a year to remove accumulated debris and other litter to maintain water flows. 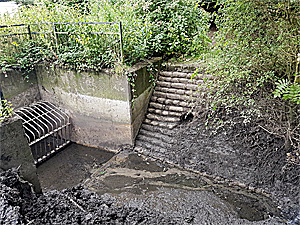 As these features do tend to collect debris and litter, there are often significant silt accumulations in these areas that further reduce the flow capacity, and this will also need periodic clearing. It is critical to ensure that water courses are well maintained and can allow water to discharge freely and we provide a full range of services to assist with this. All water courses are different, as is the flood risk, but we can generally offer a package of works to ensure that water is kept flowing and that riparian responsibilities are met.